The ability for customers to embrace both public cloud and local datacenter, plus edge capability, is enabling customers to improve their IT agility and maximize efficiency. The benefit of a hybrid approach is also what continues to bring customers to Azure, the one cloud that has been uniquely built for hybrid. We haven’t slowed our investment in enabling a hybrid strategy, particularly as this evolves into the new application pattern of using intelligent cloud and intelligent edge. We are continuing to expand Azure Stack offerings to meet a broader set of customer needs, so they can run virtualized applications in their own datacenter. Join the on-demand hybrid cloud virtual event. Announcing Azure Stack HCI solutions are now available for customers who want to run virtualized applications on modern hyperconverged infrastructure (HCI) to lower costs and improve performance. Azure Stack HCI solutions feature the same software-defined compute, storage, and networking software as Azure Stack, and can integrate with Azure for hybrid capabilities such as cloud-based backup, site recovery, monitoring, and more. 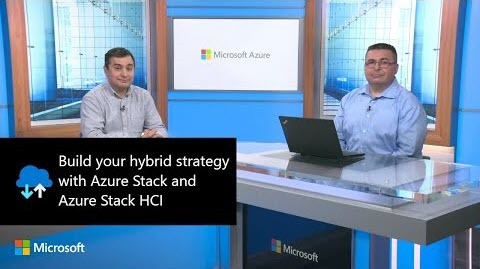 Azure Stack HCI solutions are designed to run virtualized applications on-premises in a familiar way, with simplified access to Azure for hybrid cloud scenarios. A great hybrid cloud strategy is one that meets you where you are, delivering cloud benefits to all workloads wherever they reside. Announcing the preview of Azure Machine Learning hardware accelerated models powered by Project Brainwave on Data Box Edge. This preview enhances Azure Machine Learning service by enabling you to train a TensorFlow model for image classification scenarios, containerize the model in a Docker container, and then deploy the container to a Data Box Edge device with Azure IoT Hub. Applying machine learning models to the data on Data Box Edge provides lower latency and savings on bandwidth costs, while enabling real-time insights and speed to action for critical business decisions. Announcing the general availability of Azure Data Box Edge and the Azure Data Box Gateway. Data Box Edge is an on-premises anchor point for Azure and can be racked alongside your existing enterprise hardware or live in non-traditional environments from factory floors to retail aisles. Data Box Edge comes with a built-in storage gateway. If you don’t need the Data Box Edge hardware or edge compute, then the Data Box Gateway is also available as a standalone virtual appliance that can be deployed anywhere within your infrastructure. You can get these products today in the Azure portal. Continuing our quest to make Azure the best place to build AI, we have introduced a preview of the new Anomaly Detector Service which uses AI to identify problems so companies can minimize loss and customer impact. We have also announced the general availability of Custom Vision to more accurately identify objects in images. 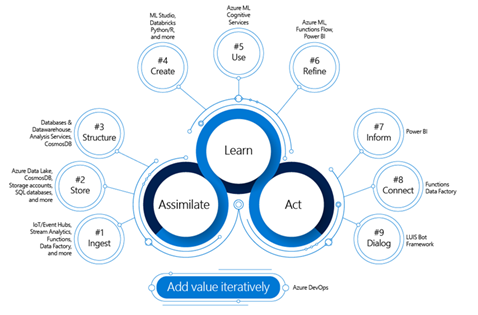 From using speech recognition, translation, and text-to-speech to image and object detection, Azure Cognitive Services makes it easy for developers to add intelligent capabilities to their applications in any scenario. Announcing Video Indexer enhancements that makes custom Person model training and management faster and easier. Enhancements include a centralized custom Person Model Management page for creating multiple models in your account; giving you the ability to train your account to identify people based on images of people’s faces even before you upload any video. Video Indexer now also supports up to 50 Persons Models per account, where each of the models supports up to 1 million different people. The new Video Indexer features are now in public preview. Announcing the preview of two new service tiers for Storage Optimized workloads in Azure Search. Azure Search is an AI-powered cloud search service for modern mobile and web app development. Azure Search is the only cloud search service with built-in artificial intelligence (AI) capabilities that enrich all types of information to easily identify and explore relevant content at scale. With Azure Search, you spend more time innovating on your websites and applications, and less time maintaining a complex search solution. Announcing the public preview of Data Discovery & Classification for Azure SQL Data Warehouse, an additional capability for managing security for sensitive data. Data Discovery & Classification alleviates the pain-point of protecting sensitive data from becoming unmanageable to discover, classify, and protect as your data assets grow. Azure SQL Data Warehouse is a fast, flexible, and secure cloud data warehouse tuned for running complex queries fast and across petabytes of data. Announcing the general availability of larger and more powerful Azure Managed Disk sizes of up to 32 TiB on Premium SSD, Standard SSD, and Standard HDD disk offerings. In addition, we support disk sizes up to 64 TiB on Ultra Disks in preview. We are also increasing the performance scale targets for Premium SSD to 20,000 IOPS and 900 MB/sec. With the general availability (GA) of larger disk sizes, Azure now offers a broad range of disk sizes for your production workload needs, with unmatched scale and performance. Our next step is to enable the preview of Azure Backup for larger disk sizes providing you full coverage for enterprise backup scenarios by the end of May 2019. Similarly, Azure Site Recovery support for on-premises to Azure, and Azure to Azure Disaster Recovery will be extended to all disk sizes soon. Announce general availability of Azure Premium Blob Storage. 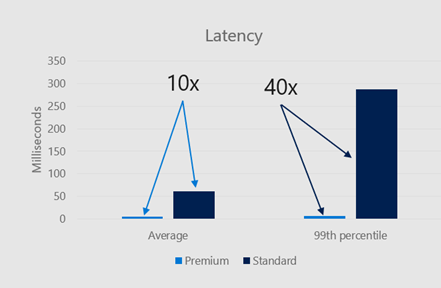 Premium Blob Storage is a new performance tier in Azure Blob Storage for block blobs and append blobs; complimenting the existing Hot, Cool, and Archive access tiers. Premium Blob Storage is ideal for workloads that require very fast response times and/or high transactions rates, such as IoT, Telemetry, AI, and scenarios with humans in the loop such as interactive video editing, web content, online transactions, and more. Premium Blob Storage is available with Locally-Redundant Storage (LRS) and comes with High-Throughput Block Blobs (HTBB), which provides very high and instantaneous write throughput when ingesting block blobs larger than 256KB. Premium Blob Storage is initially available in US East, US East 2, US Central, US West, US West 2, North Europe, West Europe, Japan East, Australia East, Korea Central, and Southeast Asia regions with more regions to come. Announcing the general availability of Blob Storage Lifecycle Management to automate blob tiering and retention with custom defined rules. Azure Blob Storage Lifecycle Management offers a rich, rule-based policy which you can use to transition your data to the best access tier and to expire data at the end of its lifecycle. This feature is available in all Azure public regions. Announcing the general availability of Azure Active Directory (AD) based access control for Azure Storage Blobs and Queues. Enterprises can now grant specific data access permissions to users and service identities from their Azure AD tenant using Azure’s Role-based access control (RBAC). Administrators can then track individual user and service access to data using Storage Analytics logs. Storage accounts can be configured to be more secure by removing the need for most users to have access to powerful storage account access keys. Announcing the general availability of a blob storage interface on Data Box. The blob storage interface allows you to copy data into the Data Box via REST and makes the Data Box appear like an Azure storage account. Applications that write to Azure blob storage can be configured to work with the Azure Data Box. With this capability, partners like Veeam, Rubrik, and DefendX are now able to use the Data Box to assist customers moving data to Azure. Azure Data Factory (ADF) is a fully-managed data integration service in Azure that allows you to iteratively build, orchestrate, and monitor your Extract Transform Load (ETL) workflows. You must periodically clean up files from the on-premises or the cloud storage server when the files become out of date. The ADF built-in delete activity, which can be part of your ETL workflow, deletes undesired files without writing code. You can use ADF to delete folder or files from Azure Blob Storage, Azure Data Lake Storage Gen1, Azure Data Lake Storage Gen2, File System, FTP Server, sFTP Server, and Amazon S3. 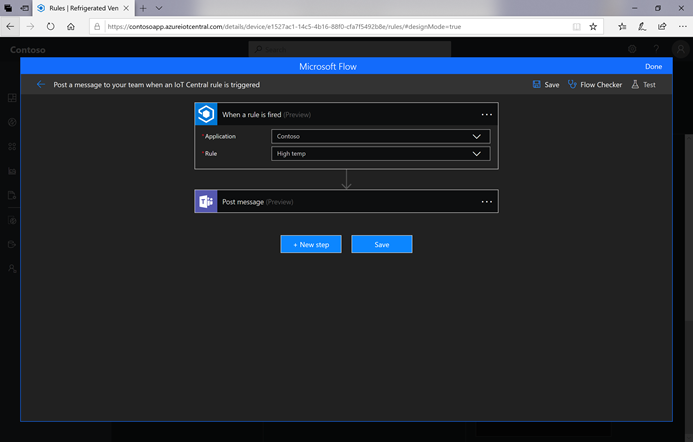 This post recaps the new features now available in Azure IoT Central; including embedded Microsoft Flow, updates to the Azure IoT Central connector, Azure Monitor action groups, multiple dashboards, localization support, and highlights the recently expanded Jobs functionality. With these new features, you can more conveniently build workflows as actions and reuse groups of actions, organize your visualizations across multiple dashboards, and work with IoT Central with your favorite language. Azure Data Factory (ADF) is the fully-managed data integration service for analytics workloads in Azure. Using ADF, users can load the lake from 80 plus data sources on-premises and in the cloud, use a rich set of transform activities to prep, cleanse, and process the data using Azure analytics engines, while also landing the curated data into a data warehouse for getting innovative analytics and insights. Now, ADF provides a new capability for you to incrementally copy new or changed files only by LastModifiedDate from a file-based store. The feature is available when loading data from Azure Blob Storage, Azure Data Lake Storage Gen1, Azure Data Lake Storage Gen2, Amazon S3, File System, SFTP, and HDFS. Announcing that High-Throughput Block Blob (HTBB) is globally enabled in Azure Blob Storage. HTBB provides significantly improved and instantaneous write-throughput when ingesting larger block blobs, up to the storage account limits for a single blob. We have also removed the guesswork in naming your objects, enabling you to focus on building the most scalable applications. High-Throughput Block Blob is now available in all Azure regions and is automatically active on your existing storage accounts at no extra cost. ExpressRoute Resource GUID name change from "Port" to "Direct"
Distributed applications take full advantage of living in the cloud to run globally, avoid bottlenecks, and always be available for users worldwide. Most cloud native applications use a microservices architecture to maximize the wide range of managed services for managing infrastructure, scaling, and improving critical processes like deployment or monitoring. 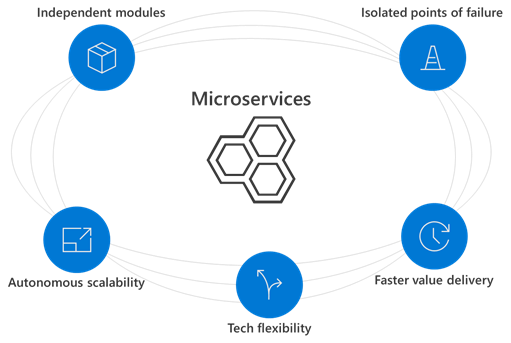 This post focuses on how building serverless microservices is a great fit for event-driven scenarios, and how you can use the Azure Serverless platform. Azure Monitor for virtual machines (VMs) collects network connection data that you can use to analyze the dependencies and network traffic of your VMs. Analyze the number of live and failed connections, bytes sent and received, and the connection dependencies of your VMs down to the process level. Get started with log queries in Azure Monitor for VMs. When you choose a specific Azure SQL Database service tier, you are selecting a pre-defined set of allocated resources across several dimensions such as CPU, storage type, storage limit, memory, and more. Ideally, you select a service tier that meets the workload demands of your application. With each service tier selection, you are also inherently selecting a set of resource usage boundaries & limits. Learn how to use governance to help set a balanced set of allocated resources. In this post, Jessica details the steps needed for running a Ghost blog in a Docker container on Azure. Azure Service Health helps you stay informed and take action when Azure service issues like incidents and planned maintenance affect you by providing a personalized health dashboard, customizable alerts, and expert guidance. Learn to use Azure Service Health’s health history to review past health issues and get official root cause analyses (RCAs) to share with your internal and external stakeholders. This blog post looks at securing traffic between pods in Azure Kubernetes Service. It outlines the basics of a demo that demonstrates the process using the Cloud Shell. In this blog post, Neil Paterson walks through the basic configuration steps for accessing Azure Linux virtual machines using Azure AD credentials. The popular podcast MSDev is joined by Suz Hinton to discuss the MXChip Microcontroller board. Folks learned what it was, why you would use it, and some other technical learnings around hardware and Azure IoT in general. Part 1 in this series covers the essentials of Serverless computing in the cloud. It defines the term and explains how to get started with Azure Functions in the Azure Portal. This is the first part of five. In this part Chris also looks at Function apps, triggers and bindings, and the practical approaches needed to use Serverless within your apps. 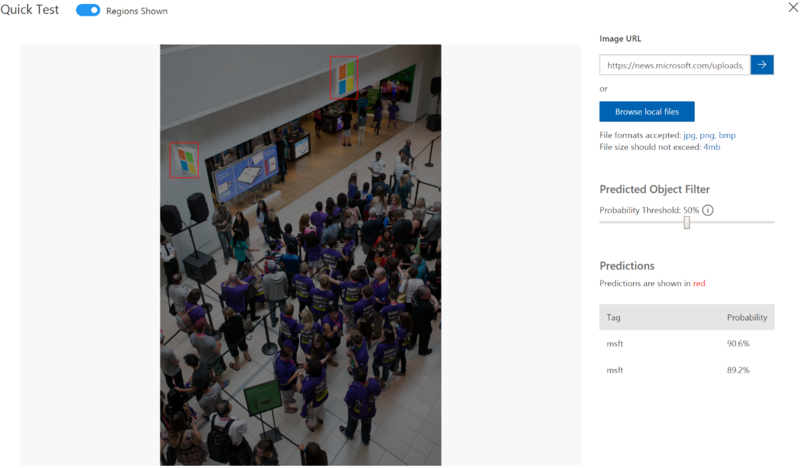 In this blog post, we will be looking into two machine learning toolkits Azure Machine Learning service (AML) and Kubeflow to compare the two approaches for a computer vision scenario where one would like to deploy a trained deep learning model for image classification. We hope this will help data scientists make a more informed decision for their next deployment problem. A fundamental quality of a cloud is that it provides an elastic pool for your resource to use when needed. Since you only pay for what you use, you don’t need to over provision. Instead, you can optimize capacity based on demand. See some of the ways you can do this for your IaaS VMs running in Azure and Azure Stack. Azure and Azure Stack makes it easy for you to resize, scale out, add and remove your VM from the portal. Damian sits down with Product Manager Gopinath Chigakkagari to talk about deploying to Azure using GitHub Actions. In this episode, Gopi walks through a deployment process inside GitHub Actions to deploy a containerized application to Azure on a new push to a repository. Along the way, he'll also show some of the features and advantages of GitHub Actions itself. 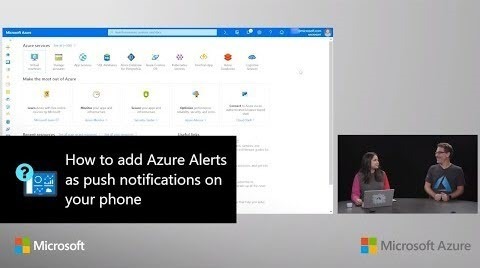 The Azure mobile app allows you to receive Azure Alerts as push notifications on your mobile device. In this video of the Azure Portal “How To” Series, learn how you can setup Azure Alerts such as metric alerts, log analytics, Application Insights, and Activity Log from Azure Monitor on the Azure portal. 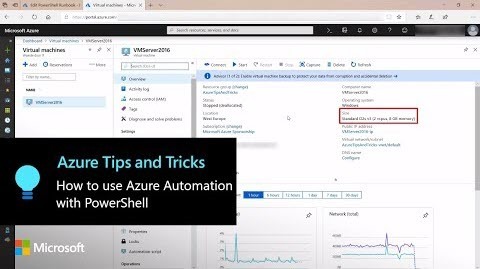 In this edition of Azure Tips and Tricks, learn how to use Azure Automation with a Windows Machine with PowerShell. Azure Automation makes it easy to do common tasks like, scaling Azure SQL Database up and down and starting and stopping a virtual machine. Jeffrey Palermo and Matt Mitrik discuss GitHub with Azure Boards. They talk about the level of integration that’s going to be in Azure Boards (how they’re thinking about things right now and where they want to go), their efforts towards new project workflow and integration for Azure Boards, and the timeline Matt’s team is looking at for these changes. Matt also gives his pitch for GitHub as the future premiere offering and why you should consider migrating. AzureABILITY host Louis Berman talks Azure with Bentley Systems' Kevin Boland—an Enterprise Cloud Architect who manages one of the largest and most complex set of Azure deployments on the planet. Hannover Messe 2019 is taking place this week (01-05 April) in Hannover, Germany and Azure is there. Manufacturing continues to be one of the leading industries adopting IoT for a growing set of scenarios to improve safety, efficiency, and reliability for people and devices. We’ve made several significant additions to our IoT platform to address these needs; including the launch of Azure Digital Twins and Azure Sphere, and the general availability of Azure IoT Central and Azure IoT Edge. Introducing a set of new product capabilities and programs that make it easier for our customers to build enterprise-grade industrial IoT solutions with open standards, while ensuring security and innovation protection across cloud boundaries. How can device builders bring a high level of security to the billions of network-connected devices expected to be deployed in the next decade? It starts with building security into your IoT solution from the silicon up. In this post, you learn about the holistic device security of Azure Sphere and how the expansion of the Azure Sphere ecosystem is helping to accelerate the process of taking secure solutions to market. To help you plan your IoT journey, we’re rolling out a four-part blog series. In the upcoming posts, we’ll cover how to create an IoT business case, overcome capability gaps, and simplify execution; all advice to help you maximize your gains with IoT. In this first post, explore the mindset it takes to build IoT into your business model. Umanis, a systems integrator and preferred AI training partner based in France, has been innovating in Big Data and Analytics in numerous verticals for more than 25 years and has developed an effective methodology for guiding customers into the Intelligent Cloud. Umanis has found it to be a robust way of rolling out end-to-end data and AI projects while minimizing friction and risk. By using this approach to present a Data & AI project to both customers and internal teams, everyone can get a good feeling of what activities, technologies, and challenges are involved. The Azure Marketplace is the premier destination for all your software needs – certified and optimized to run on Azure. Find, try, purchase, and provision applications & services from hundreds of leading software providers. You can also connect with Gold and Silver Microsoft Cloud Competency partners to help your adoption of Azure. In the second half of February we published 50 new offers. 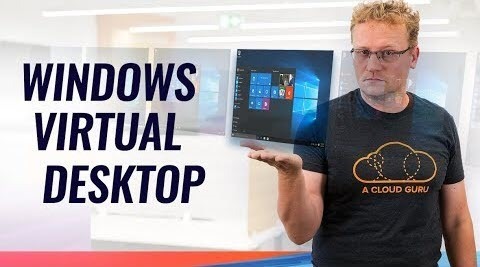 This time on Azure This Week, Lars covers Windows Virtual Desktop in public preview, Azure Cosmos DB gets another big win, and Microsoft and NVIDIA extend video analytics to the intelligent edge.